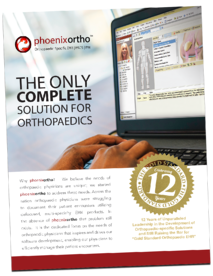 We believe the needs of orthopaedic physicians are unique; we started Phoenix Ortho to address these needs. Across the nation orthopaedic physicians were struggling to document their patient encounters utilizing defocused, multi-specialty EHR products. In the absence of Phoenix Ortho that problem still exists. It is the dedicated focus on the needs of orthopaedic physicians that inspires and drives our software development, enabling our physicians to efficiently manage their patient encounters. Please fill out the form to read more about our time and money saving features from our software suite. © Copyright 2019 by Phoenix Ortho. All Rights Reserved.